Jaguar Land Rover (JLR) is enjoying an unprecedented upturn in sales since Tata Motors took over the group in 2008, making the automotive manufacturer a major driver for growth in manufacturing across the West Midlands and beyond. Managing that success brings challenges along the supply chain due to difficulty in anticipating global demand for the vehicles, which makes production planning problematic. 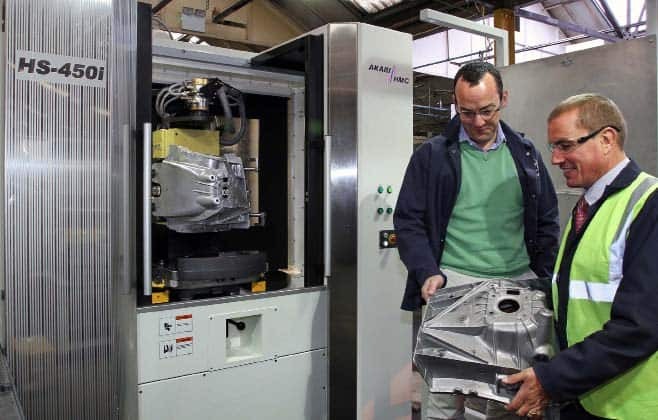 Suppliers like Worcester based JVM Castings, the largest independent aluminium die casters in the UK, must respond promptly to constantly changing demands from JLR and its other customers. So also must equipment suppliers to JVM, such as Whitehouse Machine Tools. 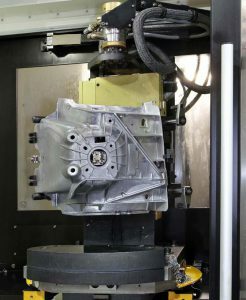 In 2013, the firm supplied an Akari HS-450i 5-axis horizontal machining centre with twin pallet changer, configured as a turnkey production cell to provide extra capacity for machining a specific casting, namely a shock tower (shaded blue in the image below) that links the chassis and suspension in Jaguar saloon cars. Turnkey preparation started before the machine arrived in the UK. To minimise the lead-time between receipt of order and delivery of the fully equipped production centre, Whitehouse Machine Tools startedpreparing elements of the turnkey installation before the Akari machine arrived in the UK. 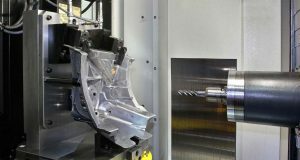 A 5-axis program to achieve the required cycle time for machining the shock tower in 3+2-axis mode was prepared in Alphacam at the supplier’s Kenilworth technical centre. It is a complex cycle, as the casting has to be milled and drilled at multiple compound angles. Most of the drilling is carried out in Op 1 on one pallet, with the component located off internal features of the casting. Op 2 is completed on the other pallet by locating off the drilled holes prior to milling the inside. To verify the NC toolpath in advance and check for possible interference before the job was run on the machine, the cycle was first simulated in Vericut, pictured above. Akari supplied CAD data defining the dimensions of the HS-450i, Leicester fixture supplier Saluki sent a solid model of the hydraulic workholding arrangement, and measurements were taken of the tool holders and cutters to be used for the application. All of this data was entered so that the cycle could be simulated. By the time the machine arrived in Kenilworth, this part of the process was complete. A Nikken rotary table was fitted to one pallet. A hydraulic fixture for automatic workpiece clamping was then mounted on each pallet to maximise productivity, as the initial requirement for 350 left and right-hand shock tower pairs per week was set to rise quickly to 550. The hydraulic supply was permanently connected through a rotary joint, which also enables air supply to sensors on the fixtures that ensure that the component has been loaded correctly. If there is no signal, the machine shuts down automatically, avoiding the expense of scrapped castings. It is noteworthy that the Nikken rotary table is closed-loop controlled directly through the machine’s Fanuc 31i NANO CNC, avoiding the need to interface a separate Nikken control box. This approach is more convenient for JVM’s operators, as they do not need to synchronise two controls. Steve Hoole, Commercial Director of JVM Castings commented, “As ever in our industry, these shock towers are price sensitive. “A 5-axis machine was ideal for keeping down the number of operations and hence the unit manufacturing cost, but such machines tend to be expensive, raising overheads and lowering the profit margin. “The Akari was less than 75 per cent of the price of the other 5-axis HMCs we considered, which really made the project viable. Despite its competitive price, the 12-tonne HS- 450i incorporates top class components such as Tsubaki ballscrews, THK heavy duty roller guideways and BIG Plus 40-taper spindle with face-and-taper contact coupling. It has thermal control of ballscrew nuts, thrust bearings, Y-axis servo mounting and spindle cartridge by means of recirculating, chilled oil. Hand scraped surfaces are incorporated for mounting the ballscrew bearing blocks and roller bearing slideways. The machine is also fast and hence ideal for high productivity applications. Speed in rapid motion and when cutting is of the essence when machining aluminium die castings. 1g linear acceleration to 60 m/min cutting feed rate within the 640 x 610 x 680 mm working volume of the Akari enables the cutter to get around the castings quickly. Together with one second servo-driven tool change, it ensures minimal idle times during the cycle. A 15,000 rpm / 22 kW direct drive spindle maximises metal cutting efficiency.